Angelina Jolie at a refugee camp in Tunisia along the Libya border. And take part in the first ever #BlueKey Tweetathon today! 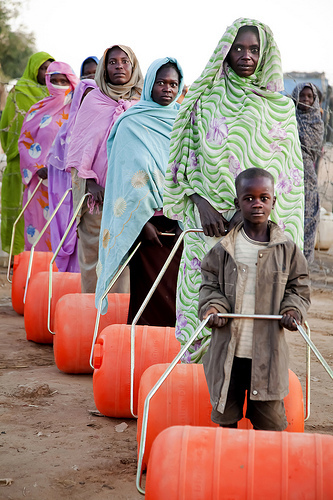 At Socialbrite, a lot of people approach us about cause campaigns. But one in particular is especially worth spotlighting this week: the Blue Key campaign, which ends with World Refugee Day next Monday. Blue Key was brought to our attention by Socialbrite’s own Shonali Burke, who is helping to show USA for UNHCR — the US-based nonprofit that supports the UN Refugee Agency — how social media can help make a real, on-the-ground difference in the lives of people displaced by war, threats of war, ethnic division and other causes. Before we delve too deeply into the refugee crisis, let’s list two simple things you can do to help out. (1) The first and most important is to order your Blue Key for a mere $5. 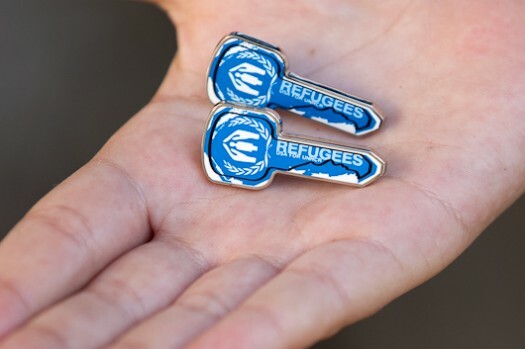 A blue key will show the 6,000+ staff members of the UN Refugee Agency around the world that we appreciate their work. The key pin or pendant symbolizes our power to help refugees open the door to a new home and a new future. (2) The second thing you can do is to spread the word about Blue Key, on Facebook or Twitter. Here are a few ready-made tweets! If you really want to go the extra mile, you can change your Twitter avatar or Facebook logo to support Blue Key, like Socialbrite has done. Today, from 9 am to 9 pm ET, several several of the Blue Key Champions (I’m one) will be taking part in a Tweetathon. We’ll be tweeting about the campaign, why we’re supporting it and urging people to get a key (remember, they’re just $5 each!). Just like in a good old-fashioned telethon, we’re going to talk #bluekey throughout the day. Just follow the #bluekey hashtag.